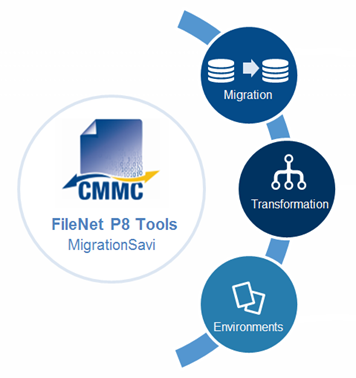 CM Mitchell Consulting’s (CMMC) migration tool, MigrationSavi, is a proprietary software product used for IBM FileNet P8 document transformations, migrations, and system changes. For migrations, MigrationSavi is used to migrate documents into IBM FileNet P8 from another FileNet environment or other document management system. Some of the features provided by MigrationSavi include content and metadata migration, document reclassification, security updates, TIF conversion and merging, and foldering capabilities. Flexible, easy to configure: MigrationSavi projects are easily configured with provided graphing tools. Supports Complex Logic: Data can be transformed, reclassified and updated during migration using MigrationSavi.